Today I wanted to show you another one of my infamous Hershey Kiss Boards, this one just in time for summer. Those little sun faces are actually inverted Hershey Kisses. Kids love them, guests love them, and I have been known to snag a few myself. Let’s get started. 1. Cut your 1/2” MDF board to a 12” x 12” size. (or have Home Depot cut it like I always do). Measure out where you want your kisses. This is where you will drill your holes. 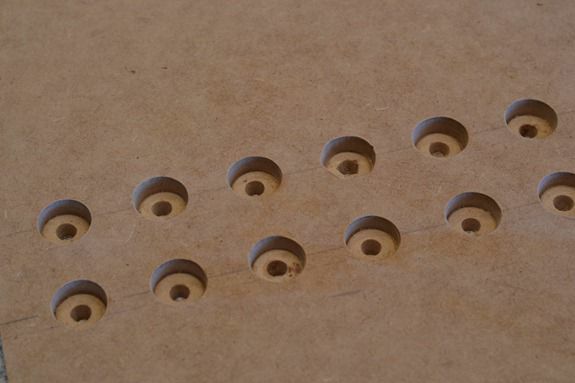 Using a 3/4” drill bit and en electric drill — drill your holes but do not go all the way through the board. The top of the bit will poke through the back but don’t drill the wide part of the bit more than 2/3 of the way. This will allow the Hershey kisses to set in there and stay. This is what the bit looks like. I am sure there is a name for it but I have no idea. 2. Mark your holes and then drill them. I measured every 1 and 6/16” and then drilled my holes. This allowed me to have 8 holes across and 2 rows of them for a total of 16 kisses. 3. Lightly sand the board with 220 grit sandpaper especially around the holes. Wipe it clean. Spray prime and paint it. I used Krylon’s Ocean Breeze. 4. Cut four 1/2” x 12” strips of paper and Mod Podge those to the sides. I used American Crafts Hello Sunshine Gleam. 5. Using a Silhouette machine print and cut out the Sunbursts and then glue them around the drilled holes. 5. Then using the Silhouette machine again print and cut out the smiley faces onto white cardstock and use Glue Dots to adhere them to the back of your Hershey Kisses. 6. Cut out the word “sun-kissed” using any font you want. I used Chunk Five and cut it out of American Crafts Secret Garden Pearl. Glue those to the board. 7. Cut out the some white vinyl and transfer it to the board. Then lightly coat the entire board and sides with Mod Podge. I use a foam roller to get an even coat with no lap marks. 7. 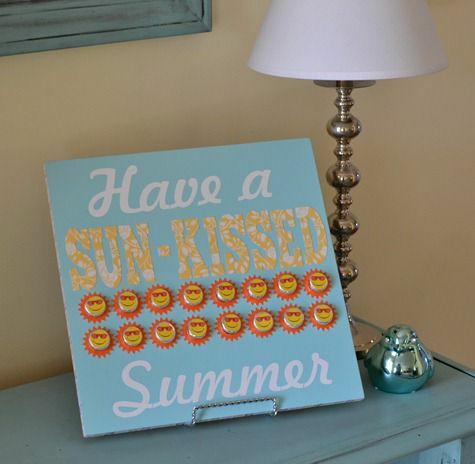 Add your smiley face Hershey Kisses and set it on an easel (I got mine from the Dollar Tree). My kids love this and having one kiss feels like such a treat to them, and me! If you want to make this project click here for all the files. I have Silhouette machine files and PDF files for those without a Silhouette machine. Click below to see more of my kiss boards. If you would like to purchase the vinyl for my Hershey Kiss Boards it is now available through Say it on the Wall.